Walker and Syers (1976) published one of the most influential papers in biogeochemistry. 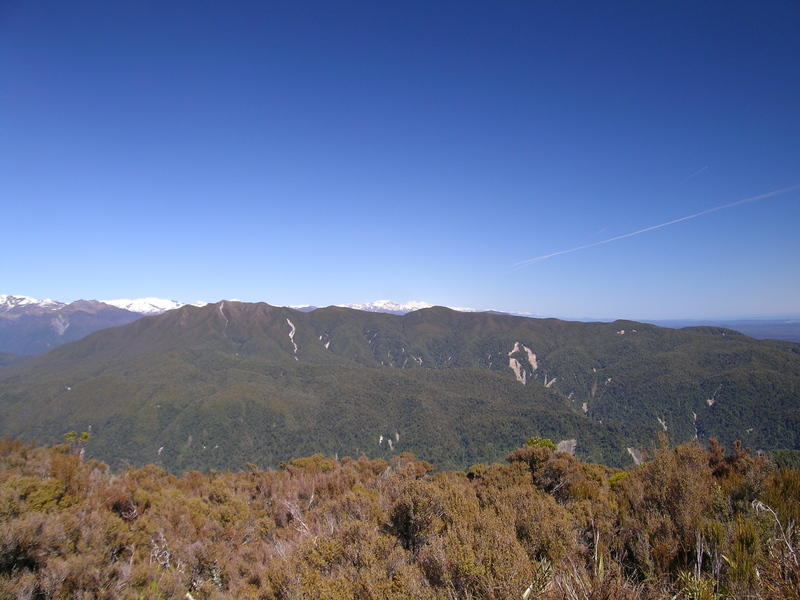 They took advantage of New Zealand’s recent glacial past to explore the effects of soil age on soil fertility, particularly phosphorus (P) availability. As the glaciers retreated from the sea at the end of the last ice age, they left behind a series of deposits that get progressively younger inland.. Walker and Syers realized that the glacial deposits made nice chronosequences, sites that vary in soil age but little else (although, in truth, rainfall varies by about a factor of 2 between the youngest sites (6 m/yr) and the oldest (3 m/yr)). Their soil analyses showed that soil P differed in two important ways between the youngest and oldest sites. First, the young sites had more total P than the old because over time P, which is derived from rock weathering, had been leached away. Second, the P that remained in the oldest sites was bound in forms that were relatively unavailable to plants. The idea that soil P availability diminishes as soils age has become central to our understanding of differences in nutrient cycling and limitation. Experimental tests of nutrient limitation across a chronosequence in Hawaii confirmed that plant growth on the oldest soils there (4.1 million years old) was limited by P, whereas on the youngest site (300 years) nitrogen (N) and not P was limiting. Tropical soils, which are often P poor, are thought to be so because they have been sitting around longer than temperate soils, many of which only started forming as the continental ice sheets retreated 10,000 years ago. 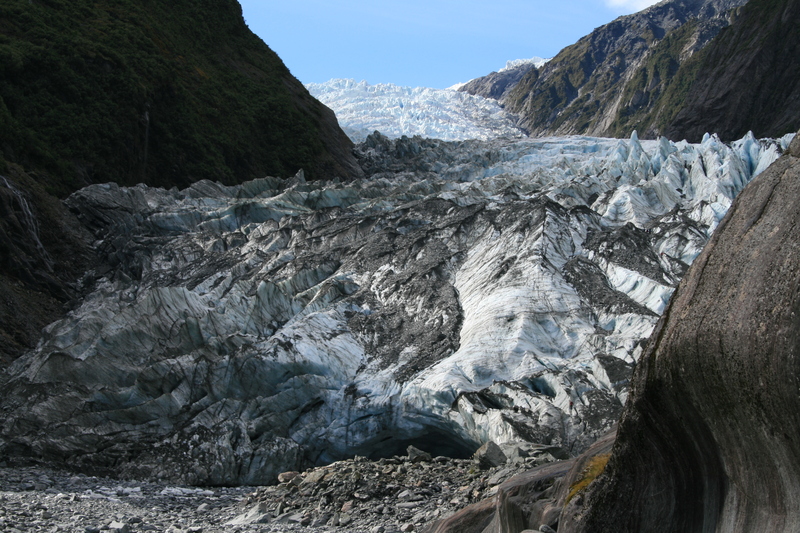 Here’s what the Franz Joseph Glacier looks like today – for scale the boulder in the front right corner of the photo closest to the lens is about the size of a large room, and the glacier is about 200m from where I’m standing taking the photo. As a graduate student and post doc I got very interested in the idea of soil age, and began to wonder how we could take what we had learned from chronosequences and apply it to the broader landscape. A key feature of chronosequences is that they are supposed to be minimally eroded (ideally not eroded at all) so that the age of the deposit (in New Zealand glacial moraines) is the same age as the soil. 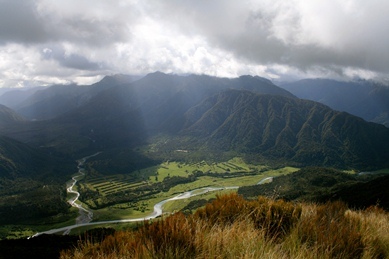 But almost all landscapes are eroded to some degree – the area of New Zealand where the Franz Joseph sites are experiences some of the fastest erosion in the world. The view below shows this nicely, look at all those landslide scars dotting the landscape! Even though the oldest glacial moraine on the Franz Joseph chronosequence is about 120,000 years old, most of the soils in the area develop for only a few hundred years before a landslide removes them. This is an extreme case, but it turns out there are very few areas in the world where we actually know the age of soils. So while chronosequences can teach us a lot about the processes that happen as soils age, they aren’t so great for figuring out biogeochemistry at the landscape scale. This is a lesson I first learned in Hawaii and New Zealand, but has informed my work ever since.